Promotional Kids Wood Grain Oahu Sunglasses are coming in a Tan color and are great for theme parties and other kids’ events. These custom kids’ sunglasses consist of an imprint area of 1 1/2" x 1/4" and they also have UV400 protection features to keep the kid safe from harmful UV rays. 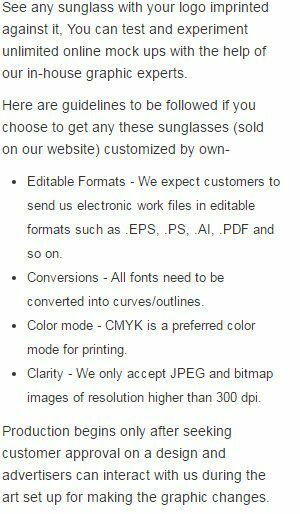 Any brand targeting kids can look forward to hiring these customized sunglasses for their promotional activities. Order now and get free artwork design and fast turnaround times. Request a quote to know the value savings that you can avail on bulk orders of Promotional Kids Wood Grain Oahu Sunglasses. Imprint Area: 1 1/2" x 1/4"
When ordering blank items of this product either exactly 1 or atleast '+35+' must be ordered!